Jo Delahaut- Original Prints-Art books-Free shipping. Jo Delahaut, painter, writer, print maker and teacher, was born in Belgium in 1911.He studied art at the Academie des Beaux-Art in Liege, later becoming Professor in Art History at the same university. 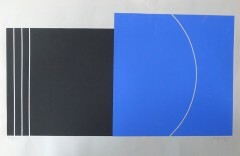 Delahaut became a leading figure in geometric abstraction in Belgium. Delahaut began to produce expressionist paintings in 1940 and he was particularly influenced by the works of the painter Auguste Herbin. In 1946 he became a member of the “Réalités Nouvelles” in Paris, the following year he became a member of “La Jeune Peinture Belge” in Brussels. Delahaut was a founder member of the Belgian group “Art abstrait” (Abstract Art) in 1952 with Mig Quinet , Louis van Lindt, Gaston Bertrand, Marc Mendelson and Anne Bonnet . He was co-author of the “Manifeste Spatialiste” in 1954 with Pol Bury among others. Jo Delahaut was also an eminent professor at Institut National de Sciences de l’Art et de la Scène (The National Institute of Sciences and the Stage) and the Ecole Nationale Supérieure d’Architecture et des Arts Visuels (National College of Architecture and Visual Arts) called “La Cambre” in Brussels.